Upon arrival, transfer to your hotel. Day at leisure. Overnight in Istanbul. Following breakfast, enjoy your full day tour of Istanbul’s highlights. Visit the Blue Mosque, famous for its blue tiles and its six minarets. Continue to the Hippodrome of Constantinople and St. Sophia, one of the greatest religious and architectural marvels of the world. After lunch, visit Topkapi Palace, the seat of government of the Ottoman Empire. The last stop is the bustling Grand Bazaar. It is the biggest "souk" in the world with nearly 4000 shops of antiques, jewelry, gold, carpets, and leatherwear. Overnight in Istanbul. *Sites will be substituted on specific days due to site closings. Morning at leisure. Consider a visit to the Chora Museum, famous for its Byzantine mosaics, or the Underground Cisterns in the old city. Afternoon transfer to the airport for a flight to Kayseri. Marvel at the twisted lunar landscape created by the successive eruptions of a now extinct volcano. The plateau is covered with volcanic lava, transformed by erosion into a beautiful landscape of cones, columns, and canyons. To avoid persecution between the 4th and 13th centuries, Christians hewed dwellings and sanctuaries into the rock, incorporating them into the landscape. Drive to Cappadocia for overnight. 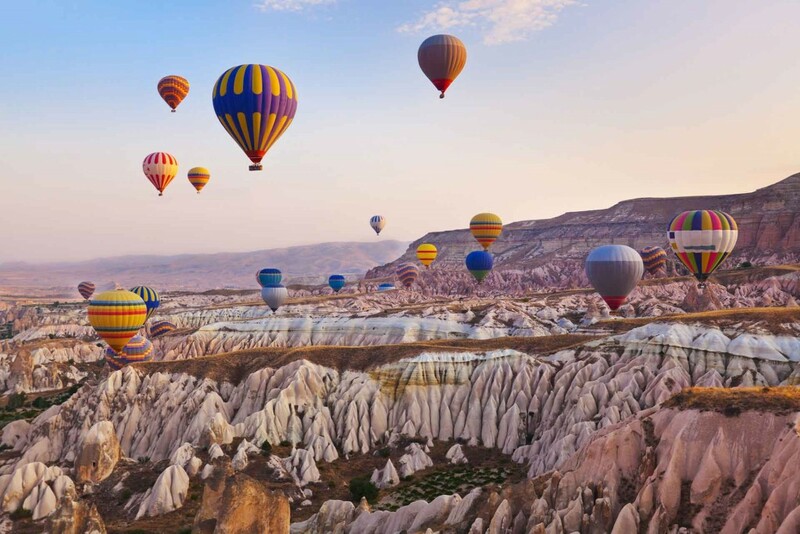 Begin your full-day tour of Cappadocia. Visit Avanos, known for its pottery; a craft dating back to the Hittite period. Continue to Goreme Open Air Museum to see the Byzantine rock churches and monasteries, carved into the fairy chimneys, dating from the 10th – 13th centuries. Enjoy the incredible frescoes painted on the walls. See the various types of fairy chimneys with multiple stems and caps in Devrent Valley and Zelve-Pasabag Valley. The tour finishes with the Uchisar Rock Castle to have panoramic views. Overnight in Cappadocia. After breakfast, your first stop is Red Valley to hike by the untouched rock-cut churches and natural rock formations until you reach lovely Cavusin, an ancient village of Cappadocia. After lunch visit Kaymakli Underground City, the largest of the underground cities, abandoned decades ago due to avalanches. The tour finishes with the famous fair chimneys of Urgup. Overnight. Transfer to Kayseri Airport for your flight to Izmir. Upon arrival, some leisure time. Overnight in Kusadasi. Enjoy a private full-day tour to Ephesus, the most well preserved ancient Greco – Roman city in the world. Visit the Arcadian Way, the Marble Road, the Great Theater, the Library of Celsius, St. John's Basilica and the Shrine of Virgin Mary. See this ancient city come to life! You will be amazed at how little life has changed. Visit the port of Kusadasi for some great shopping! Don’t forget to bargain. Overnight. All transfers are performed between 8 a.m.–6 p.m. Transfers outside these hours are at a supplement.